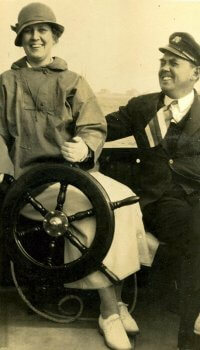 Mary Strong at the helm of her catboat, the Light, with her husband, Austin Strong. They were devoted to sailing education for children and were among the founders of the Wharf Rat Club. This summer’s major exhibition in the McCausland Gallery features stories from year-round and seasonal residents and an exciting range of objects—from boat models, racing trophies, and fishing gear to artwork, souvenirs, and toys—the exhibition will explore the many ways islanders rely on the water for work, recreation, and their connection to the broader world. Connecting: Stories of the ferryboats past and present that connect Nantucket to points near and far. Connecting will feature artwork and memorabilia from historic island steamers, plus uniforms and equipment from today’s high-speed ferries. A new short film by John Stanton will loop in the gallery and Novation Media will have a fun new interactive. Fishing: Stories of Nantucketers working on the water. Fishing by boat has always been an important Nantucket activity, providing income to year-round residents and fine seafood both on island and off. Fishing will feature an array of specialized gear needed to catch scallops through sea bass. Building: Stories of where our boats come from, and why we need different ones for different purposes. Building will feature the BeetleCat and its construction methods, and the story of Alfie Sanford’s Alerion, as well as other examples of boats being built on the island. As a companion activity, a boat building class is planned for this summer where participants may construct a pram or a skiff. The hope is that this class will become a regular occurrence. Out front, a Beetle Cat is on display and for kids to climb in, donated by Beetle Inc. in Wareham. Recreation: Stories of having fun on the water, both under power and under sail. Recreation will feature a “spotter’s guide” to the boats visible in the harbor every summer, from sleek sail racers to elegant motor cruisers to the practical little prams used to teach children to sail. Accompanying the exhibition is an array of related programs—from special gallery tours to music, films, and a new Sailors’ Scuttlebutt Lecture Series with Nantucket Community Sailing, featuring Alfie Sanford, Gary Jobson, Craig Venter, John Burnham, and Nat Philbrick. Thanks to the following supporters who have “joined the fleet” of Nantucket boat and history enthusiasts to help present this notable exhibition.